Only the greatest players in NBA history have the ability to score phenomenal amounts of points in a game. These are the NBA players who have scored the most points in a game. I'm listing the top 10 players who have scored the most points in a NBA game. These are the only players who have scored 70 or more points in a NBA game. As you will see, there are not 10 different players on this list, as one player makes the list an amazing six times. 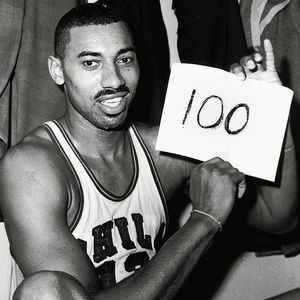 Wilt Chamberlain holds the record for the most points ever scored in a NBA game by a player with 100. Wilt's 100 point game is an absolute legend today, and it was an incredible achievement. Wilt Chamberlain set the NBA record for most points in a game by a player on March 2, 1962, while playing for the Philadelphia Warriors vs the New York Knicks. In addition to the points record, Wilt also set the NBA records for most field goals attempted (63), most field goals made (36), most free throws made (28), most points in a quarter (31 in fourth), and most points in a half (59 in second half). The Warriors beat the Knicks in the game, 169-147. Kobe Bryant of the Los Angeles Lakers scored the second most points in a NBA game with 81. Kobe scored 81 points on January 22, 2006, in a game vs the Toronto Raptors by making 28 of 46 shots, including seven of 13 threes, and making 18 of 20 free throws. Kobe Bryant's 81 point game received huge media attention, far more than Wilt Chamberlain's 100 point game did in his day. Before he scored 100 points in a game, Wilt Chamberlain set the record for most points ever scored in a NBA game on December 8, 1961, when he scored 78 points for the Warriors against the Los Angeles Lakers in a triple OT game. Despite Wilt's 78 points, the Lakers beat the Warriors, 151-147, in triple OT. Wilt's 78 points is still the NBA record for most points scored by a player in a losing effort. Wilt did not shoot well in this game, as he made 31 of 62 field goals, and only 16 of 31 free throws. On January 13, 1962, Wilt Chamberlain scored 73 points in a game vs the Chicago Packers (now the Washington Wizards). The Warriors beat the Packers, 135-117, as Wilt set the record for most points scored by a player in a regulation time game. Wilt would score 100 points in a game less than 50 days later that same 1962 season. On November 16, 1962, Wilt Chamberlain scored 73 points in a game in which the Warriors beat the New York Knicks, 127-111. This game came after Wilt's previous 73 and 100 point games earlier in the calendar year, but it was the third time Wilt scored 73 or more points in a game in the year 1962. It was also the fourth time Wilt scored 73 or more points in a game in less than a year, and the second time he scored 73 or more points vs the Knicks. As a Philadelphia native, I'm sure Wilt loved scoring big points against the New York Knicks. On the last day of the 1978 season, April 9, 1978, David Thompson of the Denver Nuggets poured in 73 points in a game vs the Detroit Pistons. Thompson entered the game just fractions of a point behind George Gervin for the 1978 NBA scoring title. His 73 points temporarily put him ahead of Gervin, but Gervin would later that day score 63 points in a game to win the 1978 scoring title. Interestingly, David Thompson broke Wilt Chamberlain's record for most points scored in a quarter in the game, when he poured in 32 points in the first quarter. Again, just hours later, George Gervin would break Thompson's record when he poured in 33 points in the second quarter of his game that day. Carmelo Anthony has since tied Gervin's record and Klay Thompson broke the record in 2015. On November 3, 1962, Wilt Chamberlain scored 72 points in a game vs the Lakers. So Wilt Chamberlain scored 72 or more points four times in 1962, and five times in less than a year. On November 15, 1960, Elgin Baylor of the Lakers set the NBA record for most points in a game when he had 71 points vs the New York Knicks. Elgin Baylor's record for most points in a game lasted for just over a year, until Wilt broke it in December of 1961. What was up with the New York Knicks? Three of the top eight games in which a player scored the most points in NBA history came against the Knicks. On April 24, 1994, in the last game of the season, David Robinson of the San Antonio Spurs poured in 71 points in a game vs the Los Angeles Clippers. Robinson was in a battle that season for the NBA scoring title with Shaquille O'Neal, and the 71 point game iced the scoring title for David Robinson over Shaq by just fractions of a point (.45). On March 10, 1963, Wilt Chamberlain scored 70 points for the last time in his career in a game vs the Syracuse Nationals. The game was the sixth time Wilt Chamberlain scored 70 or more points in a game. Wilt has six of the ten games on this list of players who have scored the most points in a NBA game.